Did you know that God is pursuing you, not out of anger or disappointment but because He desires an intimate relationship with you? The Creator of the universe invites you to walk and converse with Him, and this devotional serves as your daily meeting place. In each brief reading, best-selling author Shannon Ethridge leads you to consider Old Testament stories in a new light to learn how God interacts with His people and what that reveals about His character. Most important, as you discover more about God’s true nature, you’ll begin to recognize the ways He daily touches your life and draws you closer into His loving embrace. Shannon Ethridge is the best-selling author and coauthor of numerous books, including Every Woman’s Battle and Every Young Woman’s Battle. 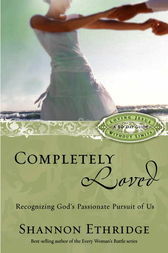 As a writer, speaker, and lay counselor, she seeks to help women of all ages discover the joy of pursuing a mad, passionate love relationship with the Lord rather than “looking for love in all the wrong places.” Shannon holds a master’s degree in counseling and human relations from Liberty University.